Search for the best flight prices from Stansted to Kos. Compare prices, book today and save money with Stansted Airport. 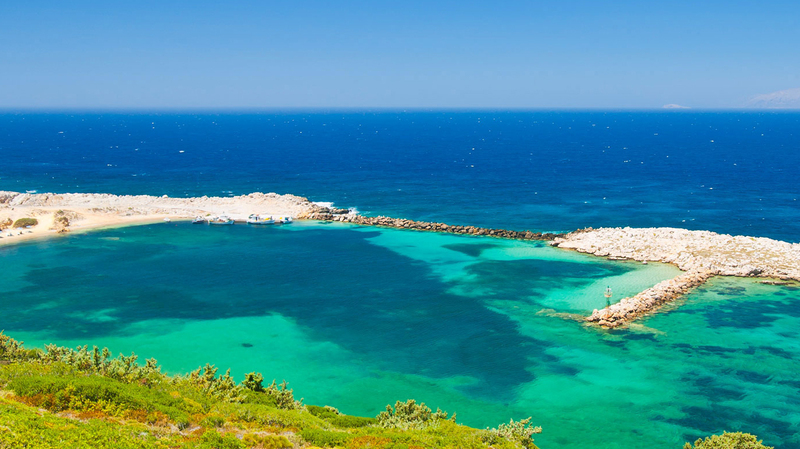 By day this thriving Greek island is a sun-drenched paradise where you can wash off all of the world’s worries in the crystal clear ocean water, while by night you can sample some truly delicious traditional Greek cuisine and embrace the hectic party lifestyle of downtown Kos. For the true party-animals, be sure not to miss out on the ‘Full Moon’ beach parties, where a night of music-fuelled revelry begins at 10pm and doesn’t stop until the sun comes up. The main-town hotels in Kos are primarily geared towards business travellers and island-hoppers, while the principle beaches of Kardámena, Marmári, Mastihári, Psalídi and Tingáki play host to the resort and convention complexes. There is a growing emergence of all-inclusive resorts in Kos Town, with two such mid-range options offering a delightful shorefront location and impressive design accomplishments being the Kos Aktis (Vassiléos Georgíou 7) and Triton (Vassiléos Georgíou 4). A more reasonably priced choice found nearby is the welcoming Afendoulis (Evrypýlou 1), while the frontrunners out at the beaches include the luxurious Iberostar Odysseus (Tingáki) and delightfully-set Kos Imperial Thalasso (Psalídi). Those looking to downtown Kos for their shopping needs will find a concentration of independent stores, Greek chains and international brands on Venizélou and parallel Ippokrátous, in addition to the short perpendicular streets that join the two. At Platía Eleftherías meanwhile, you’ll find an attractive art deco covered market that was Italian-built in 1933, and offers a great opportunity to buy up your olive oil, herbs, soaps and local wine all in one go, in addition to traditional specialities from neighbouring Níssyros Island such as soumáda (almond syrup) and kápari (pickled caper greens). Elsewhere, Hatziemmanouil is the main winery in Kos, found just west of Zipári on the island trunk road, and can be visited for picking up a tipple crafted from both local and imported grapes. There has been something of a cull of touristy tavernas thanks to the ascension of all-inclusive resorts in Kos, with those left behind tending to be the better of the previous bunch that are supported by locals. Kos Town’s only genuine ouzerí (Greek tavern), Pote tin Kyriaki (Pissándrou 9), is a favourite all year round thanks to its decent menu and strong tsípouro. Meanwhile a little south, open in the summer only is Ambavris, found in the village of the same name, which serves up great meze platters that feature local delicacies such as pikhtí (brawn) and pinigoúri (bulgur pilaff). For fresh fish Makis in Mastihári (just in from ferry dock) comes highly recommended, while at the main junction of Platáni village you'll find a trio of Turkish-run tavernas. Try Ziá hill village for an enchanting sunset to accompany your meal, where Oromedon was once visited by Bill Clinton. Patriotic displays - including folk dancing in traditional costume -mark this date in 1947, when the Greek Army was transferred the control of the Dodecanese islands. Pylí village comes alive with horse racing after morning liturgy on 23 April each year, or on Easter Monday if Easter falls later. Afterwards, music and dancing punctuates the occasion as the crowds head to the more remote chapel of Saint George above Zipári, which is complemented by drink and roast meat. Platía Eleftherías’ Orfeas cinema hosts this film festival over three days in mid-May, where short productions mainly from Greek filmmakers are showcased over the course of three hours. Things get going at 10pm with these popular summer parties at Mylos Beach Bar at Aktí Zouroúdi, Lámbi (2km northwest of town), where you can expect DJ sets, live pop and electronica, and plenty of merrymaking. Selected plazas around Kos Town play host to a variety of concerts and drama productions put on by the local municipality from mid-July to early September.